Scientists at Massachusetts Institute of Technology have developed a method to synthesize innovative ‘xenoproteins’ and screen them to identify potential therapeutics for viruses, such as Ebola. A team of chemists at Massachusetts Institute of Technology (MIT; MA, USA) have devised an innovative method to rapidly synthesize and then screen novel peptide therapeutics, to identify those with the potential to treat diseases caused by viruses. The proteins, dubbed xenoproteins by the MIT researchers, are assembled from 'mirror-image' stereoisomers of amino acids that are not normally used by cells. Xenoproteins are thought to offer huge advantages as therapeutics compared with proteins that occur naturally, largely due to their increased stability; the xenoproteins do not require constant refrigeration, and it is believed that they may not provoke an unwanted immune response. "There is no other technological platform that can be used to create these xenoproteins because people haven't worked through the ability to use completely non-natural sets of amino acids throughout the entire shape of the molecule," commented senior author of the paper, Brad Pentelute, Associate Professor of Chemistry. "Significant effort has been devoted to development of methods for the incorporation of non-natural amino acids into protein molecules"
The paper, recently published in the Proceedings of the National Academy of Sciences, highlighted advancements to the technology previously developed in the lab to rapidly synthesize long chains of proteins. The team used this technology to build protein chains comprising of 16 D-stereoisomer forms of amino acids. These D amino acids have the same chemical composition as L amino acids – the form used exclusively by cells – but are mirror images. 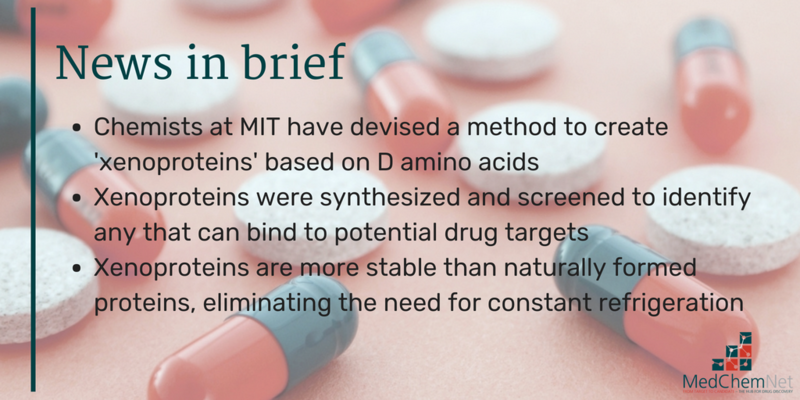 Using synthetic chemistry, the researchers at MIT were able to assemble tens of millions of different proteins, each composed of chains of approximately 30 non-natural D amino acids. The proteins produced had a folded structure based on that of a naturally occurring trypsin inhibitor. "Significant effort has been devoted to development of methods for the incorporation of non-natural amino acids into protein molecules, but these are generally limited with regard to the number of non-natural amino acids that can simultaneously be incorporated into a protein molecule," said post-doctorate researcher, Zachary Gates, who was the lead author of the study. Following synthesis, the xenoproteins were screened to identify those that could bind to an IgG antibody against a surface protein of influenza virus. These were fluorescently tagged and, using fluorescence-activated cell sorting, the xenoproteins capable of binding the tagged IgG could be isolated. "The hope is that we can discover molecules in a rapid manner using this platform, and we can chemically manufacture them on demand"
The study demonstrated the ability of the screen to identify proteins that can bind to viral targets. It was reported in other unpublished studies by the same group that the screen can also be used to identify xenoproteins that can bind to a toxin produced by anthrax and a glycoprotein produced by Ebolavirus. More research is required to identify further xenoproteins capable of binding to other potential drug targets. In the future, the team hopes to be able to rapidly synthesize and screen xenoproteins with the potential to neutralize any emerging infectious disease. "The hope is that we can discover molecules in a rapid manner using this platform, and we can chemically manufacture them on demand. And after we make them, they can be shipped all over the place without refrigeration, for use in the field," concluded Pentelute.